If you'd like to temporarily suspend your tablet subscription for Ocean services (e.g. your clinic is closed over the summer), you can deregister your tablet from the Ocean Tablet Administration Menu. Open the Ocean Tablet app on your tablet. Tap the Ocean logo (or cog) at the bottom left corner of the main screen. Enter your Ocean username and password to access the Administration Menu. 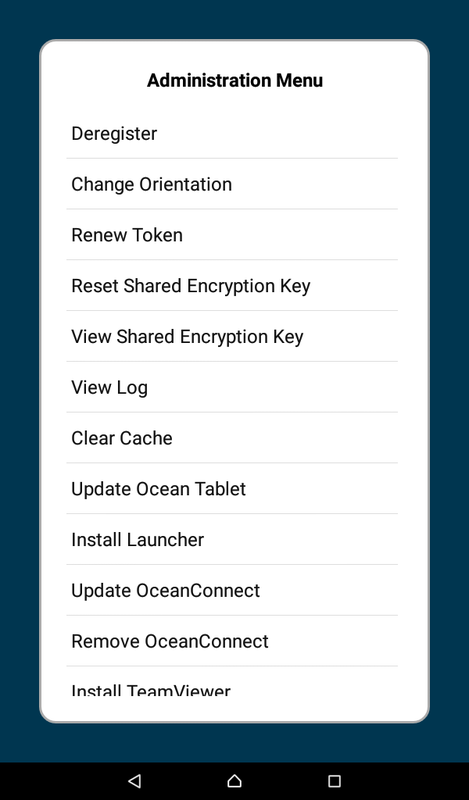 Note:You will need to have admin access to your Ocean site to be able to access this Administration Menu on your tablet (to learn how to grant admin access to users, please refer to "Granting Users Administrative Access to Your Ocean Site"). From the Administration Menu, select "Deregister". You will want to permanently deactivate your tablet from the Ocean Portal if you are no longer using it for Ocean and/or if it has broken, was stolen, or was lost. Find the tablet(s) that you wish to deactivate. Click on each of them and choose "De-register" to deactivate them.